[S416] Arthur Hastings Grant, Matthew Grant, Page 5. [S416] Arthur Hastings Grant, Matthew Grant, Page 27. Mary Creecy was the daughter of Levi Creecy. Mary Creecy married John Skinner, son of Joshua Skinner and Sarah Wingate Creecy, on 15 June 1780. Mary Creecy died on 5 January 1782. Sarah Harvey was the daughter of Thomas Harvey and Mary Blount. Sarah Harvey married John Skinner, son of Joshua Skinner and Sarah Wingate Creecy, in 1786. Thomas Billings married Anna Harvey, daughter of John Harvey and Sarah Blount, on 3 February 1820. 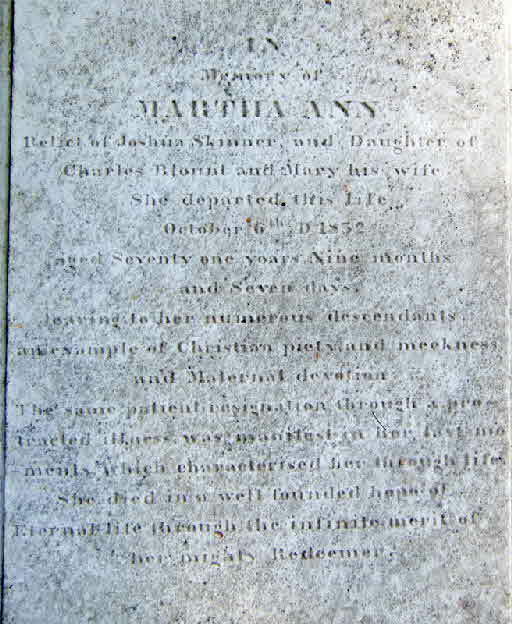 [S807] Find A Grave, online http://www.findagrave.com, Find A Grave, database and images (https://www.findagrave.com : accessed 20 June 2018), memorial page for Martha Ann Blount Skinner (28 Sep 1770–6 Oct 1832), Find A Grave Memorial no. 72549139, citing Bethel Baptist Churchyard Cemetery, Bethel, Perquimans County, North Carolina, USA ; Maintained by James Standing (contributor 47531370) . Samuel Simpson was the son of John Simpson Jr.
Robert Bellville Simpson was born on 7 January 1838 at Bantam, OH. He was the son of Samuel Simpson and Elizabeth Griffith. Gen. John Simpson was born on 21 January 1840 at Bantam, OH. He was the son of Samuel Simpson and Elizabeth Griffith. Gen. John Simpson married Laura Sophia Chaffee, daughter of Nathan Munroe Chaffee and Harriet Chapman. Gen. John Simpson died on 30 October 1914 at Texas City, TX, at age 74. Laura Sophia Chaffee was born at Newport, RI.1 She was the daughter of Nathan Munroe Chaffee and Harriet Chapman.1 Laura Sophia Chaffee married Gen. John Simpson, son of Samuel Simpson and Elizabeth Griffith. Louise Morgan Simpson was born on 20 June 1878 at Carlisle Barracks, PA. She was the daughter of Gen. John Simpson and Laura Sophia Chaffee. Amy DeWitt Simpson was the daughter of Gen. John Simpson and Laura Sophia Chaffee. Amy DeWitt Simpson died young. Jonathan Strong Jr. was born on 19 May 1725. He was the son of Deacon Jonathan Strong and Hannah Ellsworth. Jonathan Strong Jr. died on 17 September 1807 at age 82. [S84] Benjamin Woodbridge Dwight Elder John Strong, Vol. I:Pg. 21. Charles Strong was born on 14 April 1728. He was the son of Deacon Jonathan Strong and Hannah Ellsworth. Charles Strong died on 5 March 1810 at Bolton, CT, at age 81. Job Strong lived at Southampton, Long Island, NY. He was born on 13 January 1729 or 1730. He was the son of Deacon Jonathan Strong and Hannah Ellsworth. Job Thompson was born in 1728. He was the son of Hugh Thompson and Elizabeth Ellsworth. John Thompson was born in 1730. He was the son of Hugh Thompson and Elizabeth Ellsworth. William Thompson was born in 1732. He was the son of Hugh Thompson and Elizabeth Ellsworth. Benoni Thompson was born in 1737. He was the son of Hugh Thompson and Elizabeth Ellsworth. Sarah White was the daughter of John White and Hannah (?) Sarah married 1st Philip, 2nd, John, last, Daniel. Sarah White married Philip Smith on 11 January 1722. Sarah White married John Burk in 1734. Sarah White married Daniel Griswold, son of Daniel Griswold and Mindwell Bissell, on 5 September 1739 at Bolton, Tolland Co., CT.
John Burk married Sarah White, daughter of John White and Hannah (? ), in 1734. John Burk died in November 1736 at Drowned. Philip Smith married Sarah White, daughter of John White and Hannah (? ), on 11 January 1722. Philip Smith died on 13 April 1728. Sarah Griswold was born on 14 October 1717 at Bolton, Tolland Co., CT.2 She was the daughter of Daniel Griswold and Sarah White. [S116] Esther Griswold French and Robert Lewis French, Griswold, Page 106/Item 176. [S116] Esther Griswold French and Robert Lewis French, Griswold, page 106. [S116] Esther Griswold French and Robert Lewis French, Griswold, page 107. Anne Griswold was born on 20 March 1718/19 at Bolton, Tolland Co., CT. She was the daughter of Daniel Griswold and Sarah White. Anne Griswold married Benjamin Smith on 15 June 1739 at Bolton, Tolland Co., CT.
[S116] Esther Griswold French and Robert Lewis French, Griswold, Page 107/Item 177. Benjamin Smith was born in 1710. He married Anne Griswold, daughter of Daniel Griswold and Sarah White, on 15 June 1739 at Bolton, Tolland Co., CT.
Bathsheba Griswold was born on 2 December 1720 at Bolton, Tolland Co., CT. She was the daughter of Daniel Griswold and Sarah White. Bathsheba Griswold married Jabez Darte on 16 June 1740 at Bolton, Tolland Co., CT. Bathsheba Griswold died on 1 February 1745/46 at age 25. [S116] Esther Griswold French and Robert Lewis French, Griswold, Page 107/Item 178. Jabez Darte married Bathsheba Griswold, daughter of Daniel Griswold and Sarah White, on 16 June 1740 at Bolton, Tolland Co., CT.
Mindwell Griswold was born on 12 February 1721/22. She was the daughter of Daniel Griswold and Sarah White. Mindwell Griswold died in 1746. [S116] Esther Griswold French and Robert Lewis French, Griswold, Page 54/Item 179. Daniel Griswold was born on 26 May 1723 at Bolton, Tolland Co., CT.4 He was the son of Daniel Griswold and Sarah White. Daniel Griswold married Elizabeth Baldwin on 28 June 1744 at Bolton, Tolland Co., CT.4 Daniel Griswold married Judith (?) on 23 May 1771.4 Daniel Griswold died on 27 July 1803 at Bolton at age 80. [S116] Esther Griswold French and Robert Lewis French, Griswold, Page 108/Item 180. [S116] Esther Griswold French and Robert Lewis French, Griswold, page 108.